This salad has a delicious mixture of flavours and the perfect lunch. In a small bowl combine the goat’s cheese, dried mixed herbs and ½ teaspoon of wholegrain mustard. Mix well until combined and then divide the mixture into small pieces and using your hands roll the cheese into small balls, place in a shallow bowl and drizzle with approximately 1 tablespoon olive oil. I normally make 8-12 balls. Meanwhile place the remaining mustard into a medium sized bowl with the honey and lemon juice and whisk well. Whisk in the olive oil and mix until a slightly thick consistency has been achieved. Transfer this to a jar or bottle and store until required. Heat a large frying pan with a little oil and add in the diced bacon and cook for a couple of minutes until it has become quite crispy. Drain on kitchen paper to get rid of any excess fat. Store in a warm place until required. Half the cherry tomatoes and add them into the lettuce. 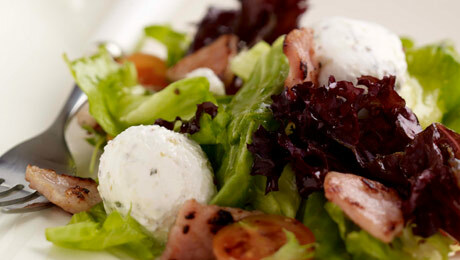 Drizzle with a couple of tablespoons of the dressing and mix well ensuring that the lettuce is fully coated. Divide the lettuce between your serving bowls, arrange some of the goats cheese balls on top of the salad and then scatter the crispy warm bacon on top.